there are simple ways to quickly get the head trammed and more accurate ways. we'll start with the quick and dirty. when you first get your mill, you should at least check for head square-ness in relation to the table. i have the vise mounted here. DO NOT do it this way. this is only for representational purposes. pretend the top of the vise is the top of the table. again, pretend that the end of the vise represents the top of the table. 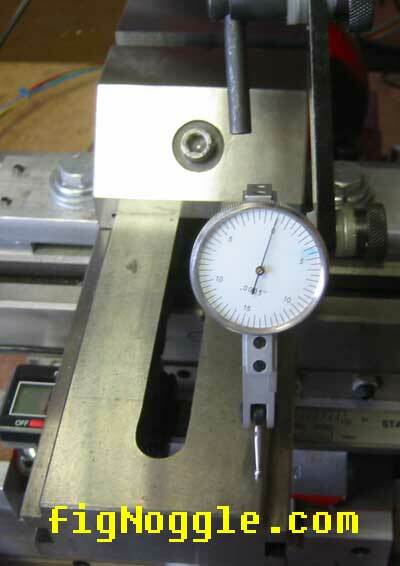 here we've use the DTI (dial test indicator) mounted to the spindle. it's of the 0.0005" resolution variety. each tick is 0.005". 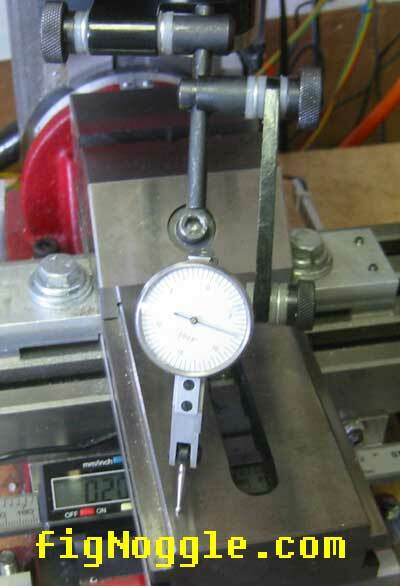 we've turned the face dial so that it reads 0.
turning the spindle by hand (from the top of the head in this case), make a sweeping motion until it reaches the other side of the table (in this representation, the other side of the vise). note that it now reads just shy of 7 ticks. let's round up. that's 7 * 0.0005" = 0.0035". not bad. not great. so we'll need to adjust the column by adjusting the nut as described in the previous section. of course, this is in a span of about 3". imagine the differential as we go further out. luckily for us, the x-axis travel is only about 7" in length. so that would equate to about .007" or so (not exact numbers here) over that span. not great. not so bad. so, based on a quick eyeballing, our read based on the quick right angle setup yielded this accuracy. not bad really. if your machining wood and other less dimensionally tolerant materials, maybe this would suffice. Tramming the mini-mill is much easier than tramming a round-column mill since the mini-mill has different articulating points for the X and Y axes whereas the round-column uses a single "point" for X and Y articulation.